Let's help them shape the content and make it "punchier", more informative, and in line with our other promo goals. First draft looks great! I like how bold the names of the apps appear on the slides. Really jumps out and looks like "confidence". Please don't take these as overly critical. I'm struggling with a patch and needed to switch my brain-gears to something else for a bit. Looks great; keep it going! The Kontact suite is the powerful PIM solution of KDE. 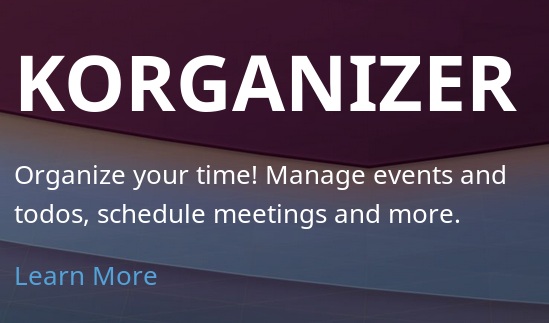 It lets you handle email, agenda, contacts and other 'personal' data together in one place by delivering innovations to help you manage your communications more easily, organize your work faster and work together more closely, resulting in more productivity and efficiency in digital collaboration. Handle your email, calendar, contacts and other personal data with Kontact. Kontact groups everything together in one place and helps you manage your communications, organize your day and work with your colleagues. 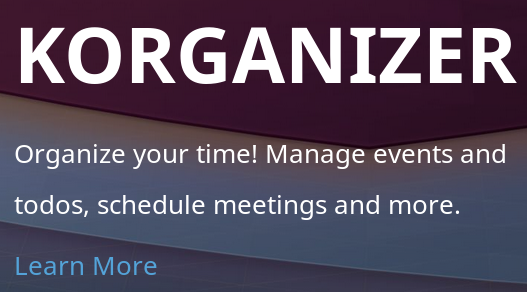 Become more productive with Kontact. To get rid of the acronyms and jargon. The "For Users" page could probably do with a FAQ. The top question I predict would be something like: "Can I migrate my stuff from y current groupware client?". That, at least, would be my main concern when considering changing to Kontact. KNotes is currently a second-class citizen (not mentioned on the front page, does not have a screenshot on the page), is that by design? Thanks for the first feedback, much appreciated! Regarding the Feature pages, I was wondering if instead of the boring bullet points we should only pick a few really major features and lead with them, including screenshots (I quite like the Thunderbird Feature page in this respect) and then just list the remaining less-prominent features below either as a paragraph of text, or just like we have now on the KOrganizer page. Regarding the Kontact page there, it a bit tricky to write about Kontact, as Kontact itself cannot do anything except for showing all the parts in a single window, the actual functionality belongs to the respective components (kmail, korganizer, ...). Maybe we could focus on some overall overview of Kontact there? I think I could rename the "Products" menu to "Kontact" and only list the components in the submenu with the Kontact page having an overview of the most killer features from each component. @sharvey the screenshots already have the shadow backdrop from KWin, weird that you don't see them on the page. I'll check the Kontact icon (I can see it in the menu, could be something on my server not serving the image properly). The obvious: It is open source, which means that (a) it is free as in speech and as in beer and (b) it is designed to protect your privacy: no sneaky-leaky closed source code syphoning off your private emails to data-hoarding corporations, the NSA, or data-stealing mafias. Kontact can easily handle all your email, be it from GMail, work or personal accounts in one clear and flexible application. Combine calendars and contact lists without having to merge them: you can see how your overall week is going to be like, showing your business meetings, dentist appointments, and flights for your holidays; or you can filter out and concentrate on one set of tasks and activities at a time, say, only work, or family, or chores. I know some of the above are common to many other groupware programs, but many users are unaware of all the features even in the solutions they are using right now. It is good that you have a screenshot on each individual component page, but maybe it should be expandable when you click on it. Like that, users will be able to get a clearer look at what they should expect to see and it will make them feel more secure when they are trying Kontact out. sorry for the long delay. I've revamped the main menu - it now says "Kontact" instead of "Prodcuts" and features submenu for Kontact itself as well as the individual components, but it will likely need some input from VDG (T9299). @vkrause has kindly written up some nice content for the KMail page, I've slightly improved KOrganizer and KAddressbook (trying to be less techy) and tried to summarize Kontact. We are asking projects with independent websites to include some branding for KDE. We have reached a consensus on the wording ("Made by KDE"), what it should look like ("Made by KDE" + KDE logo linked to kde.org), and it's location (in the top menu, on the right hand side). Can you work that into your re-design? The Kontact slide text is IMHO a bit boring. The other slides always show a direct benefit of using the application, so I think we should do this here too. An alternative would be "Handle all your email, calendar and contacts within a single window", loosely taken from the text in the blue box. I also tried to rearrange two of the info texts on the front page to be more attractive for end users, but take all of those as a suggestion and not as a definitive, best way to do it. Kontact unifies all our PIM applications into a single window to give you the best possible experience and boost your productivity. With Kontact you can use all the tools of our powerful suite in one place. Unlike proprietary web applications we value your privacy and support open standards, which is why Kontact gives you full control over your data. You can of course also access your data offline if you want to. KMail is a state-of-the-art email client that integrates well with widely use email providers like GMail. It provides many tools and features to maximize your productivity and makes working with large email accounts easy and fast. KMail supports a large variety of email protocols - POP3, IMAP, Microsoft Exchange (EWS) and more. Thanks for the feedback, @xyquadrat - I updated the texts as you suggested. I just don't understand the point about Akregator slide not corresponding to the blocks - there is a block about Akregator on the title page (maybe I added it after you checked). Or were you referring to something else? I hope that the problem is clear now & thanks for your work. There's a minor typo in the drop down "Kontact" menu on the top bar, Akregator is misspelled as Akreagtor. Also, it would be a good idea to add links to the corresponding pages under the "Not a programmer?" section on the "Get Involved" page. Great job on this website btw, kudos to all involved. Thank you all again for your help with the website. The website is live now (it went a bit faster than I expected :-D ) on kontact.kde.org and | kontact.org. Could you please help us and spread the link on the social networks? That would be nice, yes. But I don't think that Kontact is any more special than e.g. Krita, Digikam, KDevelop etc. to have its own entry on the Products webpage. Maybe a second row with links to websites of those projects and a "More ...." link to the https://www.kde.org/applications page?